On a tree-lined street in Mexico City’s Juarez neighbourhood, stands a looming white building that looks like it belongs on the streets of Ginza. 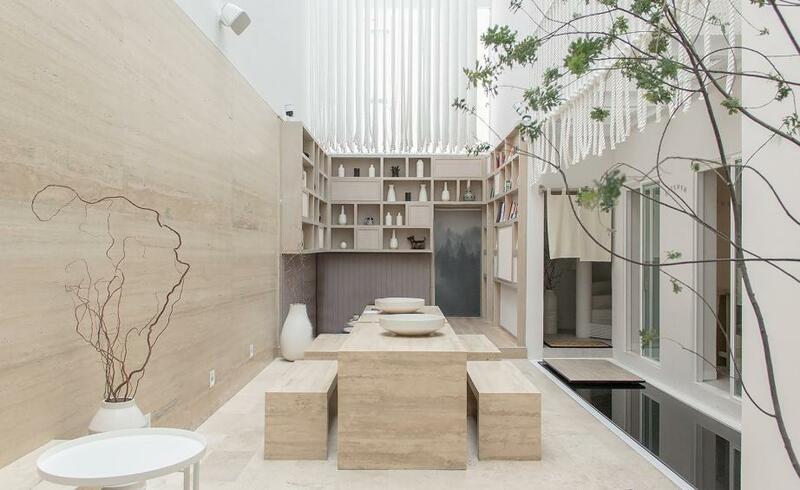 With no windows and a large glass entry door, from the pearly ribbed facade, there’s little indication that Ryo Kan is a ten-room Japanese-style inn; an oasis in the centre of one of Latin America’s largest cities.The lofty sun-doused communal area, scattered with simple terrazzo stone benches and shelves decorated with minimalist ceramics, sits below a giant tree, reminiscent of a Japanese garden. Here, guests can lounge in the zen-like space or enjoy a simple daily breakfast of coffee, fruit and yogurt. The ten tech-savvy rooms climb all the way to the top floor and have an automated management system operated by an application that does everything from close the sliding door to open the window blinds. The real clincher is the rooftop ‘onsen’ – an open-air space with a few giant round baths (masked by sliding shoji screens), from where you can wallow in the warm water and listen to the city beat below.